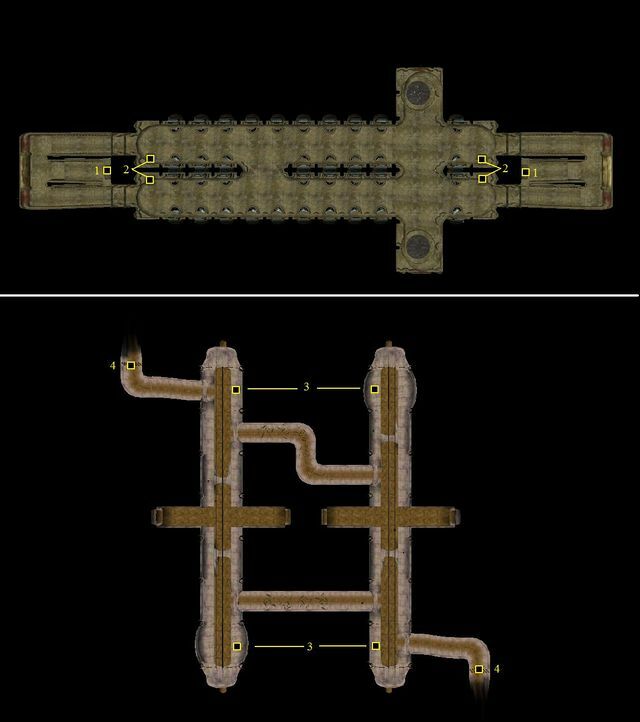 If one were to physically lift up a single canton of Vivec and transport it a good sixty kilometers east, setting it down between the Molag Amur and Azura's Coast regions, and finally removing the top dome, the city of Molag Mar would be the result. 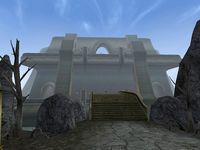 So situated simply because of its proximity to Mount Kand and Mount Assarnibibi, Molag Mar serves primarily as a home base for Tribunal Temple pilgrims on their way to those two landmarks. One of the lesser notable towns, Molag Mar is still useful to you as a resting point. 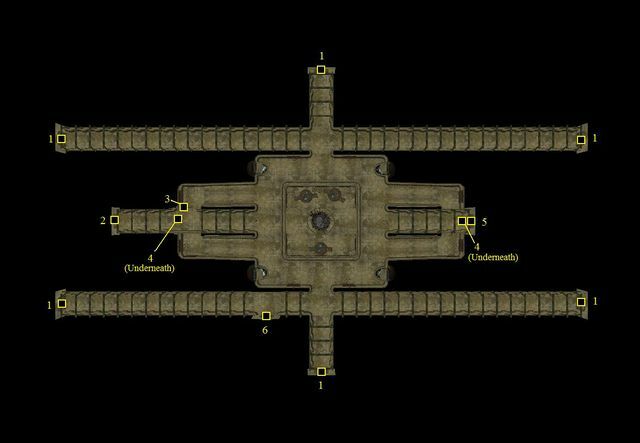 In a marked variance from the cantons in Vivec, the top of Molag Mar's canton is open to the air, and features a full Temple, St. Veloth's Hostel with beds and sundries, and a few shops. There are many pilgrims, warriors, and hunters here with many specialties – some willing to share their knowledge for a price. There is a slave market as well, along the walls. 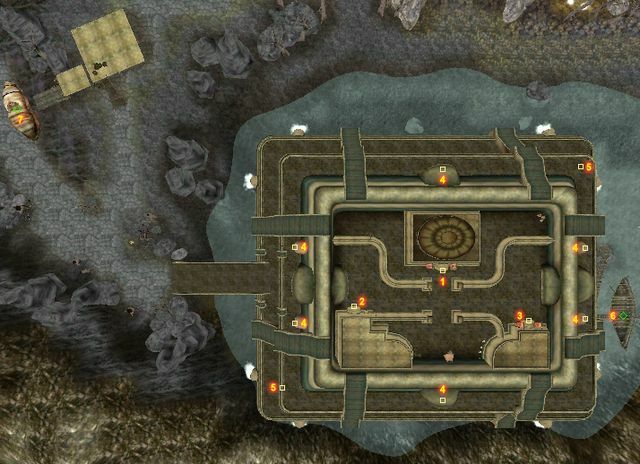 The House Redoran Stronghold houses the smith Hakar the Candle and offers some training. The Armigers Stronghold is in the middle, to the west. The Pilgrim's Rest is at the south end. Vasesius Viciulus is a Trader in his shop. For no apparent reason, the waistworks are strangely deserted. The Master Trainer in Long Blade, Ulms Drathen, resides in the Armiger's Stronghold. Tharer Rotheloth is a quest giver in the Molag Mar Temple, For a complete list, see People. Rindral Dralor, shipmaster of the Whistler, can take you to Vivec, Hla Oad and Tel Branora. 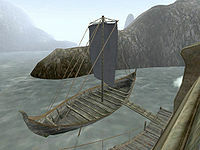 A Silt Strider port is found west of town, with service to Vivec and Suran. A path leads west to Suran. The Foyada Ilibaal and Foyada Zabirbael lead north to the two pilgrim sites, Mount Assarnibibi and Mount Kand, in the Molag Amur wastes. The trader Vanjirra is located on the western bridge outside of Molag Mar. She is looking for her business partner. The shrines at Mount Kand and Mount Assarnibibi. The Master Trainer in Athletics, Adibael Hainnabibi, is just south from here in his camp. Redas Ancestral Tomb is just south from here.